Toi and Holly were going on a Girl Scout town encampment at Camp Green Eyrie, so Muffin and I decided to go on a backpacking trip to Zealand Falls Hut and Mt Zealand. We left home at 2 o'clock on Friday, right after Toi picked Holly up after school. We stopped with them to say goodbye to Holly for the weekend. Luckily, Zealand Rd had just opened for the season so, after getting to Twin Mountain about 5 o'clock, we drove to the trailhead parking area and headed out on the Zealand Trail. This trail is relatively smooth and flat, following an old logging road into Zealand Notch. The roughest part is near the beginning, where the trail bypasses a wet area and is rocky and overgrown with roots. About halfway to the hut, the trail enters a wet area with lots of beaver ponds, dams, and houses. It crosses the wettest parts on boardwalks and bridges. We made good time, stopping only to look for any signs of beavers. After about an hour of hiking, we reached the shores of Zealand Pond. The peepers were out, and we could hear the sound of the falls resonating from across the water. After turning onto the Twinway at the south end of the pond, the trail went through a large patch of soft wet snow, then climbed steeply over rocky steps 200 vertical feet up the hut. At the bottom, we could smell something cooking, so figured that there must be guests at the hut. We also heard a dog bark. Dogs aren't allowed in the huts, so I brought our new 2-person Kelty Zen tent. We were planning on camping in the flat area below the hut, but wanted to check in with the caretaker first. 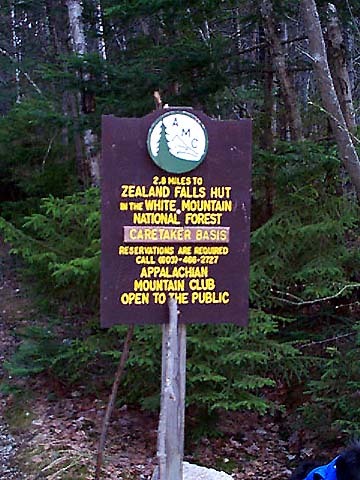 Zealand Trailhead sign. The trail begins at the end of Zealand Rd, a dirt and gravel road that's closed between November and May. It had just opened for the season 2 days before our trip. 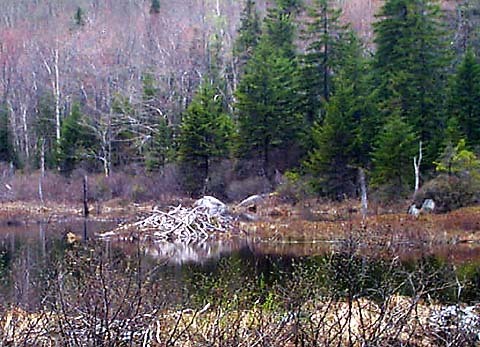 Beaver house. 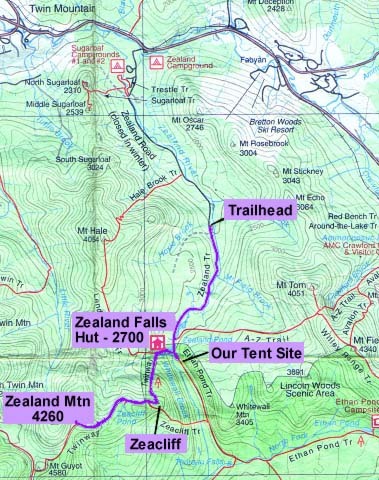 The Zealand Trail winds through several wet areas with lots of beaver dams and houses. Unfortunately, we did not see a beaver. 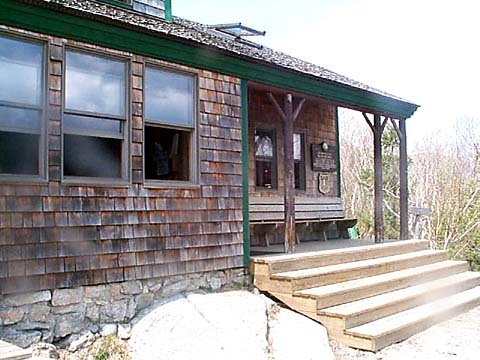 Zealand Falls Hut. The hut is located on the Twinway at the top of a 200 ft climb over rocky steps. Zealand Falls, a long series of cascades in Whitewall Brook, is right next to the hut.